Tenant/Landlord Workshop Series Reviewed by Edgeville Buzz on November 17, 2010 . 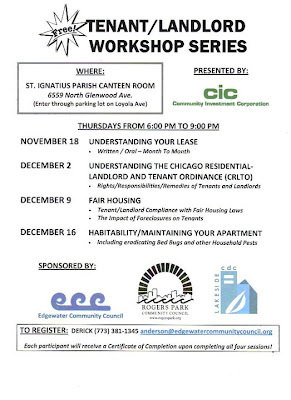 Join the ECC, Lakeside CDC and Rogers Park Community Council for a series of informative Tenant/Landlord Workshops over the next month. The workshops will be held on Thursdays November 18, December 2, December 9, and December 16. To RSVP you can email anderson@edgewatercommunitycouncil.org or call Derick Anderson at 773-381-1345. 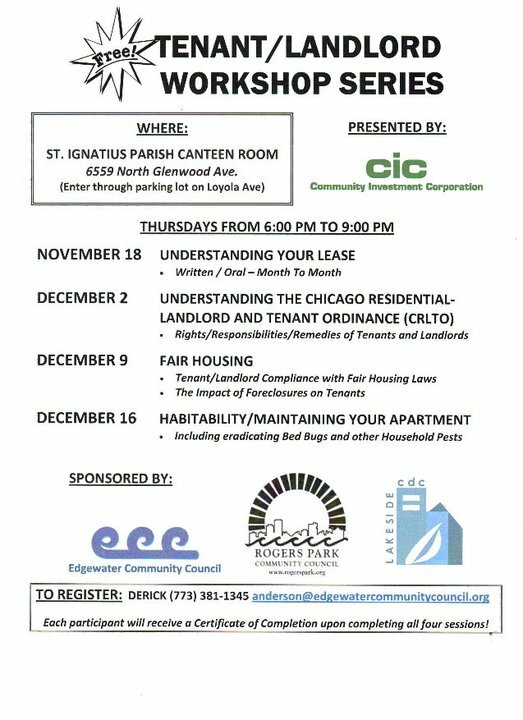 Join the ECC, Lakeside CDC and Rogers Park Community Council for a series of informative Tenant/Landlord Workshops over the next month. The workshops will be held on Thursdays November 18, December 2, December 9, and December 16. To RSVP you can email anderson@edgewatercommunitycouncil.org or call Derick Anderson at 773-381-1345.